Constellations words search. 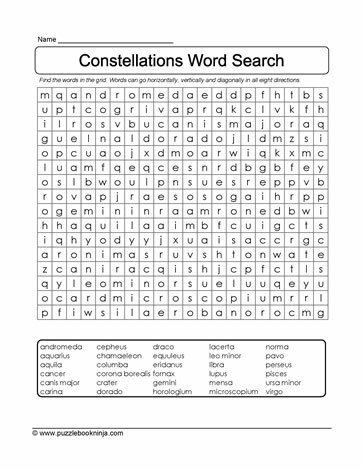 Here is a wordsearch printable puzzle to challenge students' brains to help build vocabulary. Engage problem solving skills with this downloadable puzzle. Suitable to homeschooling environments and students in late elementary grades 5,6,7 classroom. An additional extension activity might include putting the words in alphabetical order.